Ivory Coast easily beat Benin to assume a firm stranglehold of Group B.
Captain Didier Drogba opened the scoring on 40 minutes when he was put through by Yaya Toure. Toure then converted a cross from brother Kolo Toure four minutes later before Kader Keita pounced on a defensive error on 52 minutes. Aruna Dindane converted the fourth just after the hour while Razak Omatoyossi's injury-time header was Benin's second ever Africa Cup of Nations' goal. Benin coach Reinhard Fabisch came into the match amid revelations of being asked to fix his side's opening match against Mali. With just 24-hours to confirm his allegations, he handed Muri Ogunbiyi a place on the bench after the midfielder apologised for a mid-week falling out. Ivory Coast coach Gerard Gili went for an attacking approach with Lyon striker Kader Keita being preferred to defender Steve Gohouri. As has become customary with many of the double-headed matches at the Nations Cup, the Sekondi Sports Stadium was half empty for the kick-off of the first match of the day. However, the crowd in attendance were as noisy and exuberant as ever, and were soon cheering when Chelsea striker and Elephants' talisman Didier Drogba thrashed a shot from 15 yards high and wide of the Benin goal. The Squirrels showed early promise too, with Helsingborg striker and Uefa Cup top scorer, Razak Omotoyossi hitting the side-netting from ten yards. 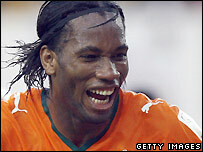 However, the formidable Ivory Coast attack started to make its presence felt, when Drogba crossed to an unmarked Aruna Dindane at the back post, only for the Lens striker to head against the post with the goal at his mercy. On thirty minutes, a cracking long-range effort from Stephane Sessegnon tested Boubacar Barry at the other end while Kalou picked up a yellow card shortly after to rule him out of his side's next game against Mali. But the Elephants charged again when Barcelona's Yaya Toure played in Drogba, who cantered through the middle of the Benin defence before shooting home through Chitou's legs to give the Ivorians the lead five minutes before half time. The favourites could smell blood and four minutes later they had doubled their lead. Kolo Toure picked up a corner from deep, dribbled past two defenders before laying the ball across an open goal for his younger brother to apply a simple finish. Benin refused to go down without a fight though, and came close to scoring thanks to an on-target shot from Oumar Tchomogo. The strike was saved, but Kolo Toure injured his groin stretching for the ball and had to be replaced with Steve Gohouri before the teams went in for the break. The Benin defence cracked again on 52 minutes when Damien Chrysostome lost possession on the edge of his own area allowing Keita to apply a simple finish to give his side a 3-0 lead. Dindane, despite fluffing a chance from three yards out minutes earlier, gave the Ivorians their fourth when he headed into the far corner of Chitou's goal from Drogba's flicked cross. Ivory Coast played out the game in cruise-control and could afford to substitute Drogba for Werder Bremen's Boubacar Sanogo with 23 minutes left to go. Tchomogo had a good chance for Benin with nine minutes remaining, when he smashed a shot against the erratic Barry from 15 yards after latching onto a poor clearance. The Squirrels' perseverance finally paid off when Razak Omatoyossi headed a bullet header past Boubacar Barry in injury time to claim Benin's second ever goal in the Africa Cup of Nations and their consolation for the day. Ivory Coast: Boubacar Barry, Arthur Boka, Emmanuel Eboue, Abdoulaye Meite, Kolo Toure (Lahore Gohouri, 45), Yaya Toure, Didier Zokora, Aruna Dindane, Didier Drogba (Boubacar Sanogo, 66), Salomon Kalou, Abdul Keita (Kouassi Yao, 75). Subs Not Used: Tiassa Kone, Loboue, Zoro, Djakpa, Fae, Romaric, Tiene, Arouna Kone, Bakari Kone. Benin: Rachad Chitou, Khaled Adenon, Damien Chrysostome (Noel Seika, 66), Stephane Sessegnon, Alain Gaspoz (Mouritala Ogounbiyi, 50), Romuald Boco, Razack Omotoyossi, Oumar Tchomogo, Anicet Adjamossi, Seidah Tchomogo (Abou Maiga, 58), Jocelin Ahoueya (Wassiou Oladikpikpo, 82). Subs Not Used: Amoussou, Djidonou, Oketola, Rouga, Koukou, Traore, Oladipikpo, Ouzerou, Soglo.